Passed away peacefully with her daughter by her side on Saturday, November 17, 2018 a few days short of her 99th birthday, a long life, well lived. Predeceased by her loving husband Bud. Devoted mother and best friend of her daughter JoAnn Grime, gardening buddy and golf partner for her son-in-law Bob and beloved Nana of Geoffrey (Victoria, BC). The daughter of a Vimy veteran and his Scottish nurse, Ailie as she was known to family, grew up with her brother Jack in Milton with summers spent at Sauble Beach. She enlisted in the first women's division of the RCAF in WWII. It was at Trenton she was given her nickname Cookie and met her future husband Bud. Together they built two businesses, Corbett Sports of Oakville and the Shelburne Golf Course. Cookie was a natural athlete who had the most effortless golf swing. Her true passion, however, was gardening of every kind. Trees were planted and beds built wherever she or the family resided. A gracious lady, beautiful inside and out, Cookie was known for her twinkling eyes, a lovely smile and ready laugh. 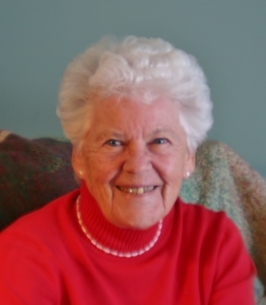 Having lived for many years in the granny flat spoiling the family with her love and cooking, it was tough when Mum had to leave home yet she remained a gentle soul, true to herself despite the challenges of dementia. Special thanks for their love and support to lifelong friend Deb Campbell, as well as Barb and Fred Greenwood. Our appreciation goes to all departments at Dufferin Oaks for their work on behalf of residents. Sincere gratitude to 2nd floor staff for the care, companionship and compassion you provide the residents in ways large and small. In respect of Cookie's wishes, cremation will be followed by interment alongside Bud at the Stone Church Cemetery, Beaverton. Please take a moment to revisit a memory of Cookie. If desired, donations to Dufferin Oaks, for the Quality of Life Team, would be appreciated. “Those we love don't go away. We encourage you to share any memorable photos or stories about "Cookie" Alison Blair. All tributes placed on and purchased through this memorial website will remain on in perpetuity for future generations. In memory of Alison (Cookie) Corbett. We know how well Cookie was treated at Dufferin Oaks. Always with care and compassion. Celebrating the life and mourning the loss of this special lady. Our condolences to JoAnn, Bob and Geoff. With sincere sympathy, JoAnn, Bob and Geoff. I will remember those twinkling eyes and wonderful smile. Sorry to hear of your mom's passing, JoAnn ..... my sympathy to you, Bob and Geoff. Cookie was a sweet lady, always. Cookie was a great lady, warm, friendly and kind. She did have sparkling eyes and a beautiful smile. We always enjoyed our annual blueberry picking outing. She will be fondly remembered by all who had the good fortune to know her. Sincerest condolences to JoAnn, Bob, and Geoff. Although no words can take away the sorrow that you bear. May it be comforting to you to know that others care and have you in their thoughts plus prayers. Thinking of you at this time. Celebrate your wonderful memories often.